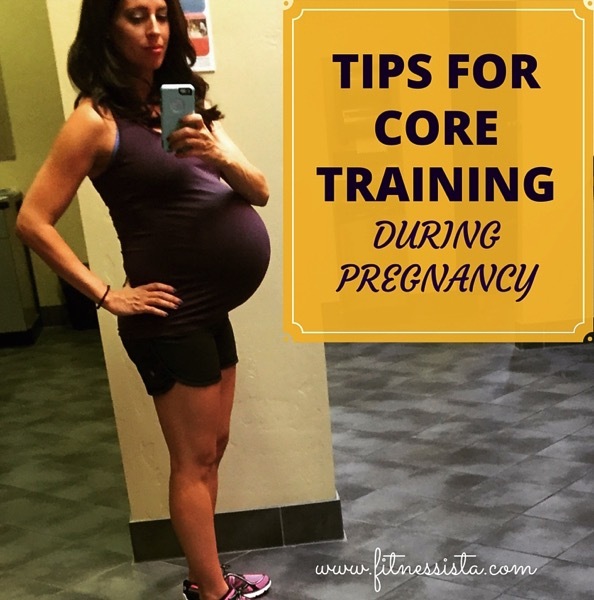 Core training during pregnancy was something that I was totally clueless about when I became pregnant with Liv. I did as much research as possible, and at the time, was teaching in Tucson at a health/fitness resort (so I had a lot of amazing resources to ask! ), and was able to determine a few hard and fast rules for core work during pregnancy. I also have an incredible resource here in San Diego: my good friend Jess, who is a Physical Therapist, Certified Pilates Teacher and group fitness instructor. She also posts workouts on her page, and has her own fitness DVD series. Basically, she’s a rockstar. Thank you, Jess, for collaborating with me on this post! 3) Instead, work on strengthening the deep transverse abdominis through stabilizing exercises like planks (as long as they feel good). 4) Avoid overtaining the obliques. During pregnancy, your abdominal muscles separate to make room for the baby. After the baby is born, they will work to go back to place. If you’re overtraining your obliques, you can essentially train your muscles to pull apart farther. We don’t want these muscles to get insanely strong during pregnancy; wait until after baby is here! Also, avoid any exercises that make a “cone” shape with the belly. This is excess pressure on the ligaments and separation of the belly, and can potentially lead to Diastasis Recti symptoms following the birth. Why is core training important during pregnancy? -It can help prevent back pain. This is critical during pregnancy and afterwards. Late night nursing sessions, carrying the baby, and what I call the “mom reflexes” (<— quickly twisting, squatting, reaching, and doing whatever you need to do to prevent a crisis), are all supported by a strong core. If your core remains strong, it’s less likely to cause back pain as you move through the daily activities. A strong core also helps prevent sciatica, which many pregnant women suffer from. -It promotes healthy posture. Posture changes during pregnancy, as the center of gravity shifts and you’re walking around with a bowling ball attached to your waist. By training your core, you will more likely be able to safely adjust for your various stages of posture as the baby grows. Squat your heart out. Kegels were supposed to be all the rage, until recent research suggested that they could shorten the pelvic floor muscles and causing potential difficulty during birth. Instead, squats are now heralded as a safe and effective way to strengthen your glutes and lengthen the pelvic floor muscles during pregnancy. Because your center of gravity is shifted, stand next to a wall or hold onto a chair for balance if you need it. Go as deeply into the squat as you feel comfortable. My chiropractor told me that deep yoga squats are awesome for the end of pregnancy, as it helps baby get into a good position for birth. This is when it’s a good time to start doing kegels. Ina May Gaskin says you should do kegels the day you give birth! Start with stabilizing work (planks), and move into rectus abdominis and oblique work later. Honor your body. It will tell us what it needs, and it’s up to us to listen. If something feels great (and the doc gave you the ok! ), keep on doing it. If something starts to feel uncomfortable or wrong, it’s an excellent time to stop and adjust.